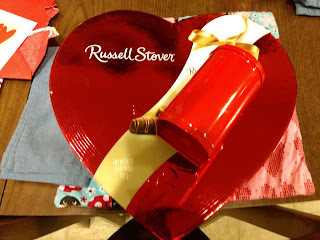 Happy week after Valentine's Day! Or Happy Lent! Or both! How about that? I'm having a hard time believing that we're already past the middle of February - how in the world did that happen? We have had a crazy couple of weeks - nothing really serious but I've been feeling a bit like I'm getting pecked to death by hens as of late. So many things that are just taking up way more time than they should! We will see how it all plays out in the end. We have been trying to stick to our reduced grocery budget. I feel like we aren't doing so well and then John reminds me how much we have not spent and I feel better. This week we bought apples at 6lb/$5, corn chips $2, and potatoes 10lbs/$5. A gallon of milk for just under $4. I'm not quite staying in the $15/week that I wanted to (went WAY over last week) but we should end up just about where we want to at the end of the month. 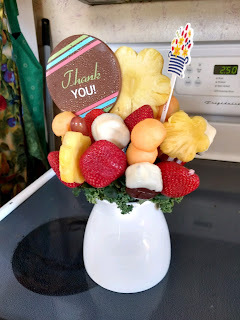 John received the above fruit bouquet as a thank you from the family of one of the funerals he officiated this last week. It as such a neat idea and we really enjoyed the fruit. The white items are chocolate/candy covered bananas. This was a complete surprise and we enjoyed every bite! Thank you W. family! I didn't get to the grocery store until Sunday afternoon, after all the busy-ness of the weekend was completed for us. I bought a few things in the way of groceries, but not much. We cut our grocery budget in half for the month and we're hoping to apply the rest to some outstanding bills that we have. So, February is going to be a Pantry Challenge Month here at our house. No grocery photo again this week - my children are getting way too efficient at putting those things away! Seriously, I brought in two bags, went back out to collect the last one and the rest of my "stuff" and it was all put away! I love it but it does mean grocery photos are pretty much non-existent. I'm going to have to warn then next week in advance - I do want those photos! Saturday was a busy day that ended with a wonderful birthday party for a friend. So, errands were bumped to Sunday this weekend. This was a week with three stops - two grocery stores next door to each other and then a drug store on the way home. The drug store stop was only because I needed to pick up a knee brace for our son - the only place close by to purchase one. Our son took this photo about hallway through the huge snowfall we had a week and half ago. In reality it's one of our fenced vegetable plots (the "towers" in the middle are trellis for climbing veggies such as pole beans). The children both thought it looked like a snow castle and took a photo - I completely agree! 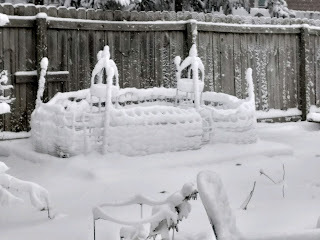 It's melted now, so we just have the fence and trellis with snow on the ground but I'm thoroughly enjoying the photo!